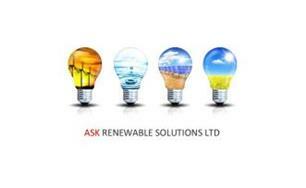 ASK Renewable Solutions Ltd - Renewable Energy based in Winstanley, Lancashire. ASK Renewable Solutions Ltd are a renewable energy company that install, repair, service and maintain renewable systems nationwide. 16 Years experience and vast knowledge in the indusrty allows us to survey both domestic and commercial properties to ensure the smallest and largest of jobs have the most up to date technology and design. We offer a free desktop quotation and a free site visit if required. Solar Thermal Installs / Solar Thermal repairs and maintanance. Gas / LPG and Oil Boilers installation, replacement and repairs.